The family room was in reasonable condition when I purchased the home, other than very dirty carpet (which I cleaned multiple times), drywall cracks/nicks and some minor electrical issues (one dead switch and the builder-grade switches and wall plates). The ceiling fan was also making clicking noises when set to high. There was also some ugly hackery done by the previous owner: speaker wire dangling out of two corners of the room with no support for the drywall, and holes drilled through the baseboard for more speaker wire. Design-wise, I hate the gas fireplace, and the faux chimney on the roof has problems. At some point in the future, I intend to replace the fireplace with a wood-burning peninsular fireplace. The peninsula will allow a fire to be enjoyed from the family room, dining room and kitchen. I'll probably replace part of the wall with an LVL beam to open up the space a bit. I have not done much in the family room yet, other than replace light switches and wall plates and install a new ceiling fan to replace the original. I also installed a couple of GFCI receptacles with built-in nightlights. The whole house needs new flooring, family room included. The family room drywall needs to be repaired in a few areas, but I won't get to that until the roof issues have been addressed. Connect RG-6 cable in basement. I balanced the ceiling fan as best I could, using the balancing kit that came with the fan. It's not perfect, but there is no wobble from speeds 1 to 6. It wobbles a little on speed 7, but I normally run the fan at speed 6 or slower. I installed a Pass & Seymour GFCI outlet with nightlight (1595NTLTRWCC4) on the north wall of the family room near the kitchen. This receptacle previously had its top outlet controlled by a pair of wall switches, which really didn't make any sense since the outlet is in a location where anything placed there would be directly in the way of traffic to/from the kitchen. Hence I capped the red wire in this box, which may later be utilized for lighting on the short part of the family room ceiling. I installed a second Pass & Seymour GFCI outlet with nightlight (1595NTLTRWCC4) on the angled part of the north family room wall near the stairs to the second floor. I bought a Harbor Breeze Edenton 52" ceiling fan at Lowe's to replace the plain white ceiling fan in the family room. The original fan looks to have been in place sine the house was built, and it's ugly and making a noise on high that appears to be internal. It also has no light, and I want some more light available in the family room without adding a lamp. The new ceiling fan has a light kit, and its style is more appropriate for my end goal decor-wise. I also bought some LED candelabra bulbs at Home Depot to use in the ceiling fan's light kit. I removed the old ceiling fan. I installed a new matchin 24" downrod on the new fan motor and installed it and wired it with the remote receiver for the Lutron MIR-LFQMT hidden in the canopy. I then removed the shipping blocks from the fan motor, and assembled and installed the fan blades. Finally, I installed the light kit, the glass shades and the new LED light bulbs. The fan works well and I like it much more than the one it replaced. I buttoned up the 4-gang switch box in the family room with a Baldwin 4742.150.CD satin nickel wall plate. It now has two Lutron Maestro IR dimmers (for the recessed lighting and the wall sconce), a Lutron Maestro MIR-LFQMT IR dimmer and fan control for the ceiling fan and a Lutron Maestro MA-S8AM for the upper outlet in the receptacle near the stairs. It looks nice and provides all of the functionality I want. Today I was reminded of a question that came up on houzz.com when I was looking for ceiling fan ideas. 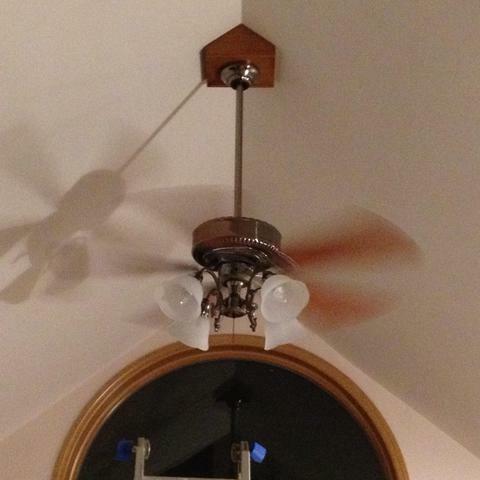 A homeowner asked if ceiling fans were "design suicide", I agreed with the designer's reply: "Design suicide? What could be worse than sweating in your own home? The designers who tell you otherwise place appearance before comfort and that's not good design, that's vanity." The discussion went on to mention that there are many stunning looking ceiling fans these days, and ones with DC motors are starting to appear. The DC fans are VERY efficient, silent, have 6 or more speeds, and can be reversed from a remote control instead of needing to flip a switch on the fan housing. My next ceiling fan will likely be one with a DC motor. The Baldwin switch plates arrived, along with the Lutron Maestro MIR-LFQMT-WH, MA-S8AM-WH and MA-AS-WH. On my way home from work, I picked up another Lutron Maestro MA-RR-WH companion dimmer so I can replace the dimmer and switches for the ceiling fan in the kitchen. I also picked up a Lutron Maestro MA-T51H-WH timer switch for the master bathroom exhaust fan, and another Lutron Maestro dimmer. Finally, I picked up another Cree 2700K BR30 LED bulb, to complete the transformation of the stairway and 2nd floor hallway lighting to LED. I installed the Cree 2700K BR30 LED bulb in the last spot in the 2nd floor hallway. So nice to be rid of the slow-to-brighten CCFL bulbs, and to know I won't need to change the bulbs again for a VERY long time. I installed one of the single-gang Baldwin wall plates, over the audio volume control in the family room (which will likely be removed at some point). It's not quite as nice as the Amerelle Madison plates, but I like it nonetheless. Despite Baldwin's advertising touting their American roots, the plates are made in China and hence the price isn't justified. The base price isn't much higher than the Amerelle Madison plates, but they're not available with free shipping like the Amerelle plates were. Hence they're $5 more per plate, which is expensive. I installed the Lutron Meastro MA-S8AM-WH and MA-AS-WH switches in the family room to replace the toggle switches that control one of the outlets in the receptacle near the stairs. It was more work than expected due to the 4-gang switch box in the family room being shallow. I needed to add a neutral wire connection, so I had to remove all of the other dimmers to add a connection to the neutral wire bundle. I ordered some Baldwin satin nickel wall plates to replace the hideous almond builder-grade plastic switch plates. I'm doing this now because I want them here before I do any paint work, and it doesn't look right to have high quality Lutron Maestro switches and dimmers surrounded by very low-grade switch plates. I also ordered a Lutron Maestro MIR-LFQMT-WH 300W IR dimmer and fan speed control. While my current ceiling fan doesn't have a light kit, my next one probably will. And I want the IR control so I can dim all of the lights at once via remote control when we want to watch a movie, without going to the switches. I also ordered an MA-S8AM-WH 8-amp switch and MA-AS-WH companion switch to replace the switches that control the top outlet in two of the receptacles in the family room. I stopped at Home Depot for some Durham's Rock Hard Water Putty and some sanding sponges to fix the various holes and gouges in the interior doors. I finally set up and connected some of my audio/video in the family room. I haven't placed the surround speakers, and the cable TV box isn't connected in the basement, but I can now watch things with my Apple TV with 3 front channels of audio plus my subwoofer. Since my long-term intent is to finish the basement and have the theater room there, I will eventually go much sparser in the family room: a flat screen 1080p LCD on the wall, in-wall speakers, and a small subwoofer. My only components will be a cable TV box, a small receiver, an Apple TV and a BluRay player. I wired the two new Cat5e cables into Cat5e jacks in the Leviton panel in the modular box in the basement. I tested the runs with my cable tester, they're good to go. Next up will be the new RG6 cable, then I'll run some Cat5e for the master bedroom. I installed the RJ45 jacks on the end of the new Cat5e cables in the family room. I crimped a new RG6 connector on the new RG-6 cable. I installed RG-6 jacks on the pair of RG6 cables (one new, one old). I then inserted all 4 jacks into the new 4-port wall plate and installed the plate on the wall. I fixed the new RG6 cable to the ceiling in the basement. I need a Leviton 47693-16P to clean up the RG6 cabling in the basement. The previous owner had 5 or 6 splitters strung together in a huge mess, just dangling from the ceiling. They're all disconnected at the moment since I intend to pull all of the RG6 cables into my structured wiring enclosure and plug them in to a Leviton 47693-16P. I cut a new hole for a rework box in the family room. However, I haven't populated it. It's adjacent an existing box that had a single RG-6 cable in it. By cutting the adjacent hole, I was able to fish a pair of Cat5e cables and an RG-6 cable into the existing box. I will use the new box too, but what I have now is enough to get my audio/video gear set up in the family room. I've been looking for a new ceiling fan for the family room. The existing one appears to be original (20 years old), and has no light kit. It wobbles, and it's ugly. But the light kit is the most important part to me, I want a fan with a light. I'd also like one that's more efficient and looks nicer. I really like the Harbor Breeze Slinger 72-in Brushed Nickel Indoor Downrod Mount Ceiling Fan with Light Kit and Remote. It has 6 speeds, a DC motor, and is Energy Star rated. I would want the Fanimation TW30WH 6 Speed DC Reversible Fan and Light Wall Control to go with it, since I'm not fond of not having a wall-mounted control. I also like the Pilot 60 in. and 52 in. Brushed Nickel Ceiling Fan, but its reversing switch is manual and it's not Energy Star rated. I ordered a 1/2" installer drill bit and flex drill bit kit from Home Depot to try to get ethernet into the family room. I picked it up on the way home. Form the basement, I can't see the phone line that leads to the phone jack in the family room. I have a sneaking suspicion that it was never wired. I'll remove the wall plate and check. That's where I'd like to have ethernet for my Apple TV and other things, if it's accessible. I had no trouble finding the RG59 for cable TV. However, that isn't an ideal location if I want my cabling to be somewhat hidden. Of course, I don't intend to keep this setup in the family room for all that long.